Too Buys for Christmas is full of colourful and memorable songs and script present the true meaning of Christmas in a lively and imaginative way, based around the story of Isaiah the innkeeper at Bethlehem. There are opportunities for dance and some simple part-singing and at the back of the book there are photocopiable song texts. The FREE CD includes a demo of all songs plus backing tracks. Too Busy for Christmas by Alison Carver is published by Kevin Mayhew and is our 33971st best seller. 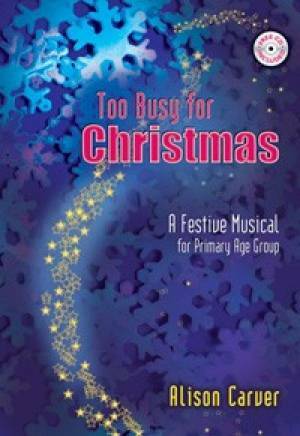 The ISBN for Too Busy for Christmas is 9781844172740. Be the first to review Too Busy for Christmas! Got a question? No problem! Just click here to ask us about Too Busy for Christmas.